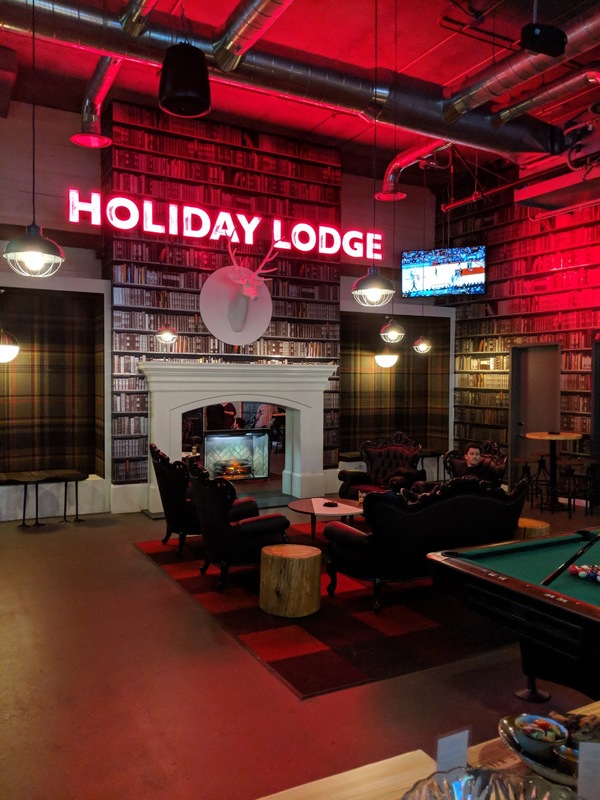 I first heard about Punch Bowl Social when I was working at my last job dealing with restaurant software. At that time they only had about seven locations around the country. Sacramento is now #11 and opens today. I got a sneak peak on Wednesday and learned some interesting things. The reason that PBS had been on my radar at my last job was that it had a connection with famous Southern chef, Hugh Acheson. He's been on many episodes of Top Chef as a judge. He happens to be PBS' Culinary Partner. The restaurants are also interesting in that they are more than just bar/restaurant, they are activity centers. 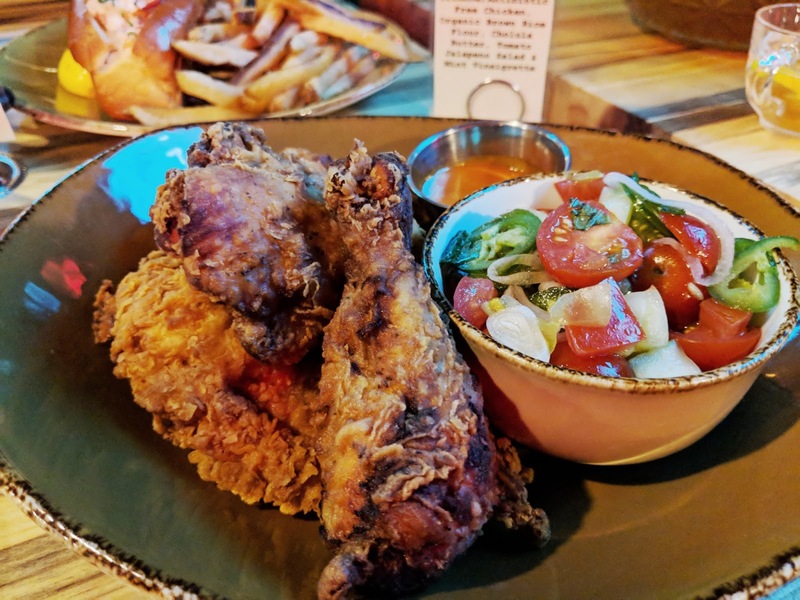 So let's start by going through what you will find at Punch Bowl Social in Sacramento. First to note is its location. It's directly across the main entrance of the Golden 1 Center and attached to the Sawyer Hotel. It is sure to be the place to hang after a game or a concert as it will be staying open until 2 a.m. every night but Sunday. Also noteworthy is that so far only the huge second floor is open with the additional first floor space scheduled to open in about February. I had to wonder why it needed a second floor! The answer came from the CEO, Robert Thompson, who was in town for the Grand Opening. PBS is headquartered in Denver and he was out with quite a corporate entourage for the press, soft openings, and opening day. He mentioned that while they love facing the arena, they also wanted a streetside (J St) entrance, thus the first floor. They wanted to be able to have some outdoor space, so the patio is off the first floor. Thompson also talked about the partnership with Acheson and how the chef not only helped with their menus, but also with training their kitchens to be able to deal with hustling meals to as many as 500 covers a night. Quite a few items were out for us to try. I loved the lobster roll in particular. 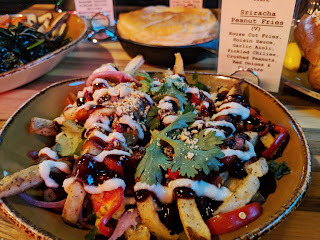 I also noted the vegetarian nachos, not knowing if adding meat is an option. 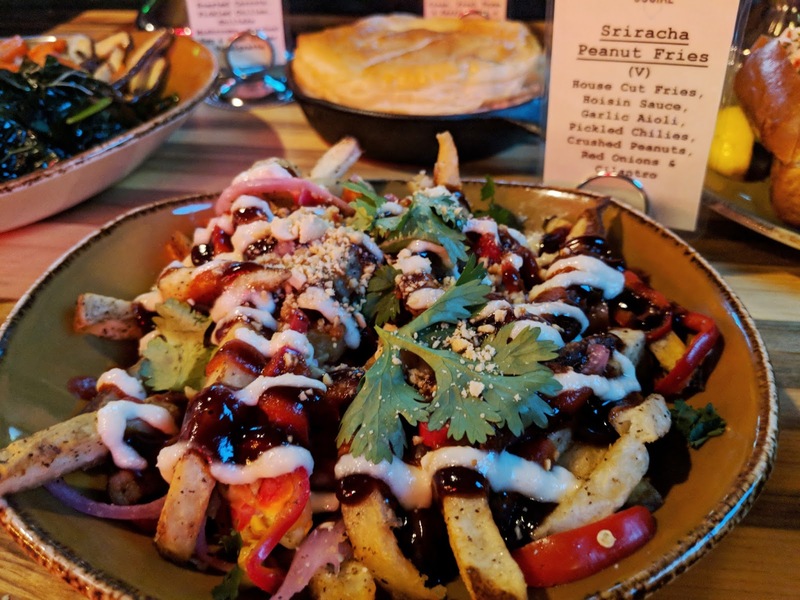 While I enjoyed the tacos, I did not really try the sriracha fries as they had gotten cold and I can't stand cold fries. 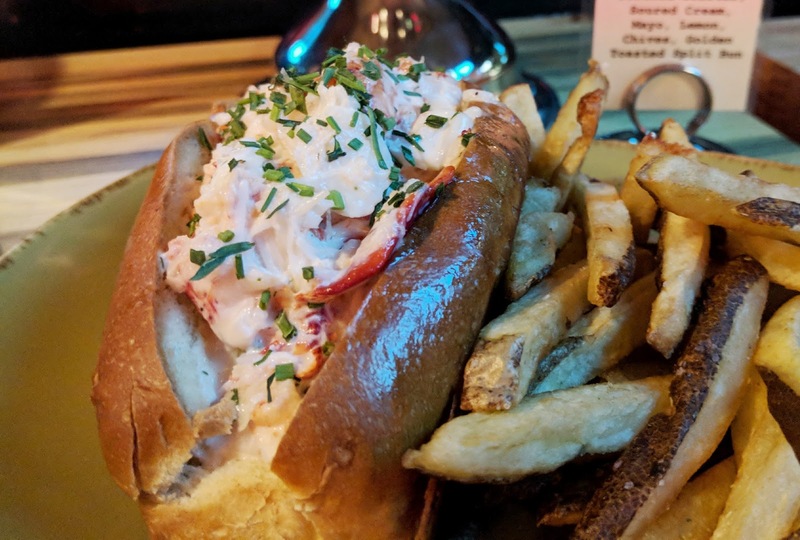 One menu item I noticed that we did not get to try was Lobster Bacon Fries. Now those sound delish! During my conversation with Thompson I commented on how happy I was to see a drink menu that had a wide selection of non-alcoholic options. While they have boozy milkshakes and specialty punches to attract fun drinking, I always look to the mocktails and other specialty sodas or drinks. I tasted a cucumber cocktail that had a cardamom syrup. Very refreshing. Thompson is a non drinker himself, so also likes to have a variety of drinks other than Coca Cola products. Got a sweet tooth? Thompson said they don't do their own desserts and choose to enlist local bakeries in each city. It was easy to guess who got the gig for Sacramento - Ettore's. Good choice! 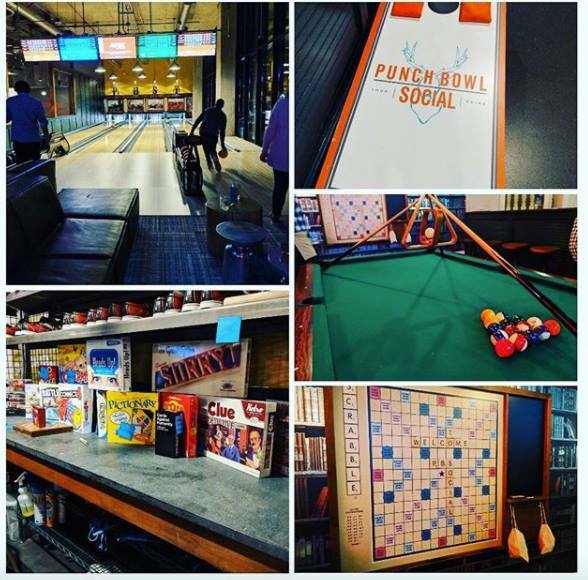 It's the activities that really make Punch Bowl different. You can now go bowling in downtown Sac! There were two sets of bowling alleys - four lanes each - on the second floor. I'm guessing there will probably be at least one set downstairs. Disclosure: My friend works at Jimboy's corporate and my visit was known and the meal was comped. There will be many people who may read this that don't live in the Sacramento region and therefore have never heard of Jimboy's Tacos. Sort of like In-n-Out Burger, it's a California thing. In fact, it's such a California thing, that you can't really classify them as a Mexican restaurant, despite the word "Tacos" in their name, because theirs is not typical Mexican fare. It's California Mexican, I guess. After all, Mexico doesn't really have Parmesan cheese on their tacos like Jimboy's does. 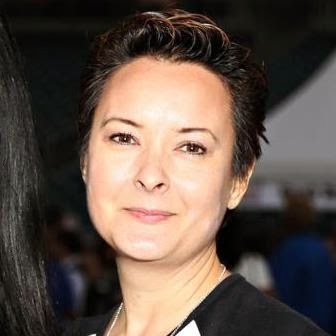 As my disclosure above states, my friend works for Jimboy's and so I've heard a lot about the changes her company has been going through over the last few years. You can read a pretty in depth history of them in this excellent article by Sacramento News & Review - The Jimboy's Story. That's why I'm not really going to get all detailed here. Long story short, over the decades Jimboy's let people get franchises of their brand, but each restaurant was different. There was no consistency in look, food, etc. Basically, it was anything goes and there was no standardization and branding. 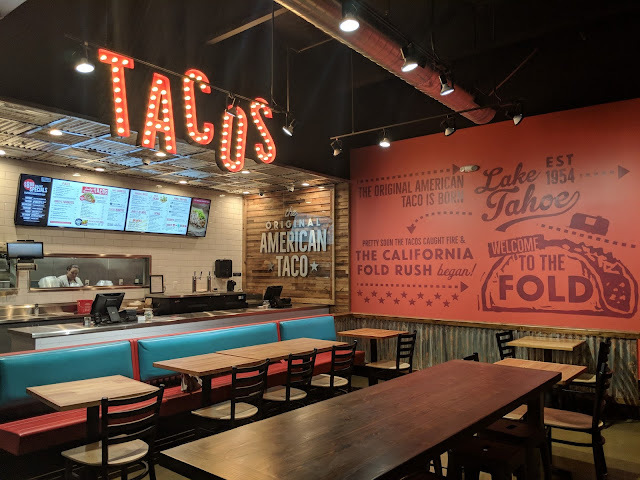 That's why you would often find the burritos better at one location and the tacos better at another location. 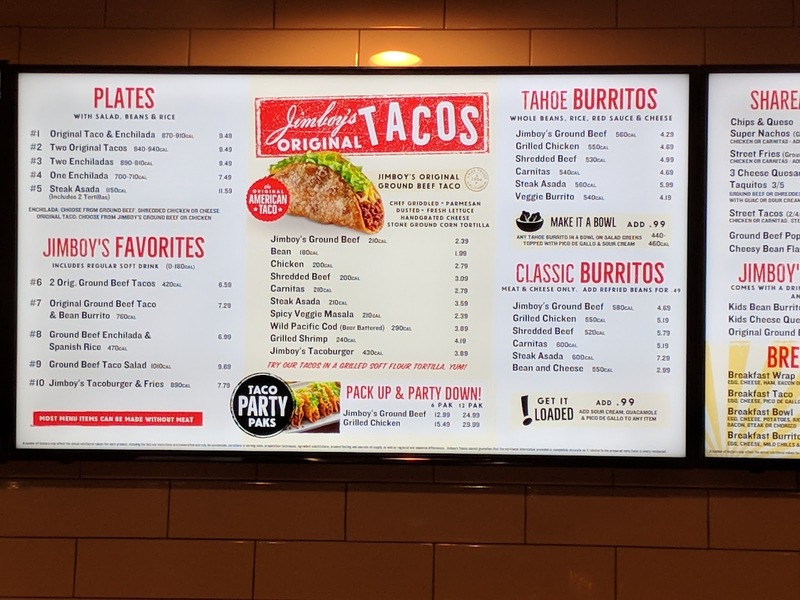 I really did know that if I went on one side of town, they did much better burritos than the one closer to my work downtown. My friend even said some owners did their own recipes. That's changing. Jimboy's is working on updating everything. They have a new look to their restaurants and they are standardizing their menus and adding new menu items. Franchise owners have been told that they can either get on board, or they can no longer be Jimboy's restaurants. This is a good thing. 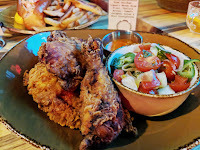 I was invited to check out the new look and a new dish at one of the newest locations in Sacramento. The new look is definitely a big change from the 70's era plastic booths. This new location was bright with lots of new wood furniture and accents. The brightly lit "Tacos" sign beckons you to read the menu that is now on modern screens versus the menu boards of old. The accent wall has large quotes tying them to the company history. In the corner there was a big screen TV with a football game on. Definitely a more enticing look, especially to attract newbies who may never have had Jimboy's before. One thing Jimboy's is really trying to promote is that they use fresh ingredients and do everything by scratch every day. There's no use of canned goods. Instead, vegetables are freshly chopped and meats cooked in small batches. This shown through in the new menu item they wanted me to try. 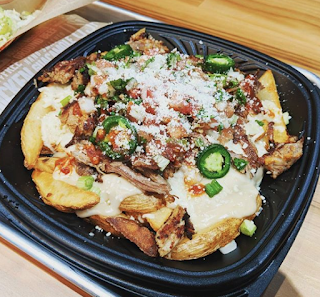 The new Street Fries are plank cut fries covered in queso, tomatoes, jalapenos, and more. Basically think of fries as nachos. I'm not kidding that I actually sat there eating the fries and mentally noting how crisp and fresh the jalapenos, tomatoes, and onions were. Another thing I noted was the how well covered the fries were. You know when you get nachos and the queso is only on the top chips so that you get frustrated that the ones underneath have no cheese? Not the case with these fries. There was plenty of cheese and toppings so that I got to enjoy every bite. Plus, you can choose what type of meat you want. They will differ in cost, but I opted for putting carnitas on mine versus the ground beef or chicken. Jimboy's are famous for their tacos that are grilled to have a crispy shell that is sprinkled with parmesan cheese. 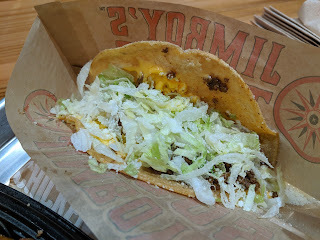 I've never been a fan of crisp shell tacos, but I figured I ought to order just one. It was a little on the salty and greasy side for me, but I could easily see why they have a following and make particularly good hangover food. 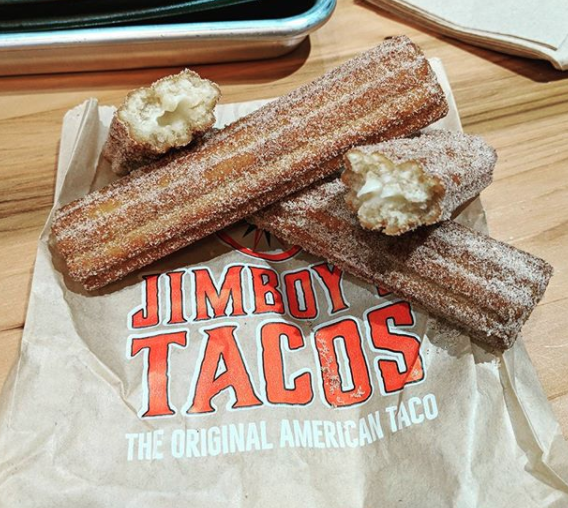 Finally, I saw cream filled churros on the menu and just had to check them out. They were nice and hot, but I was disappointed in those and would suggest you just stick to plain churros. The transition to the new look and menu is a slow one. The other day I went to a location that hasn't changed a bit. Just a note that the one near you may or may not reflect some of the changes that are being made company wide. 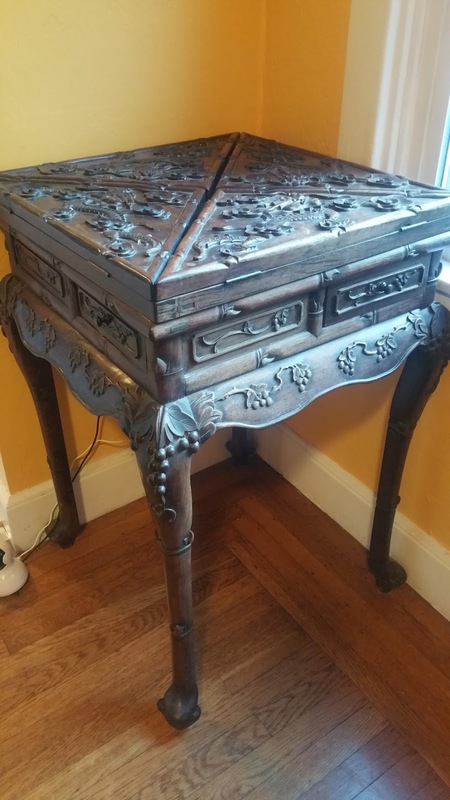 Over Thanksgiving I brought home the antique mah jong table that has always been in my family. It was my mother's and has a bit of history from her family that is interesting enough to share. My mother was an upper class Filipina who grew up in Manila. My grandfather was one of the first Filipino actuaries and I say it was fate that I ended up working in the Actuarial Office at work. Anyway... during World War II the Japanese moved in to occupy the Philippines. As in Europe with the Nazis, the Japanese moved in and took over families' homes and pretty much trampled over the locals. My mother's family was forced out of their home when it was taken over by a Japanese officer. Also similar to the Nazis who stole valuables from the Jews, the Japanese stole as well. When the Americans finally liberated the Philippines and the Japanese fled, the family was able to return to their home. That's where they found this mah jong table which had been stolen from some other family. They didn't know who it was stolen from, and so it's been in the family since. My mother ended up with it. After she died, dad says the uncles actually called to see if they could get it back, but dad told them I had always claimed it for myself some day. Please watch the video to see how really cool it is.